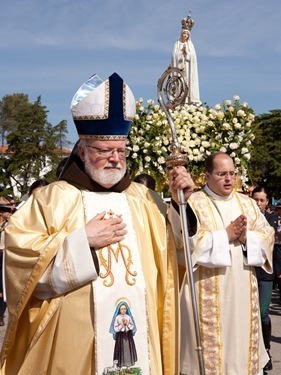 Last week I travelled to Portugal to preside over the celebrations marking the anniversary of the apparitions of Our Lady in Fatima, May 13. I was very honored to be invited. 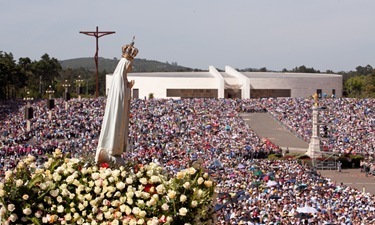 At this time last year I was also in Fatima, accompanying the Holy Father on his Apostolic visit to Portugal. Little did I know that a year later I would be coming back to celebrate the Mass for the feast day. 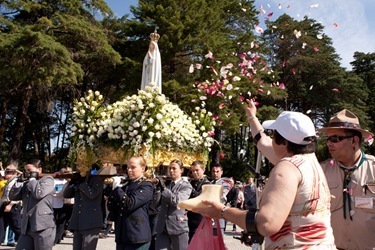 There are very large celebrations in Fatima on the anniversaries of the apparitions which are the 12th and 13th of every month between May and October, the largest celebrations being May, August, and October. 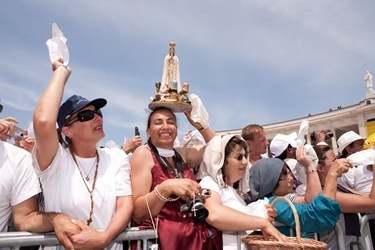 August is the month when many Portuguese immigrants who live abroad return home on vacation, and so they dedicate that month’s pilgrimage to the immigrants. 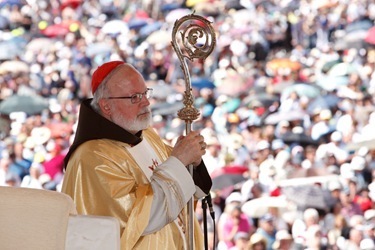 I’ve celebrated that Mass twice, but the biggest celebration of course is May the 13th itself and there were over 300,000 people there. 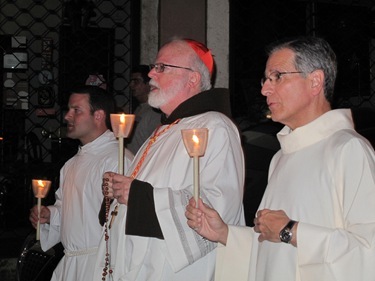 It began Thursday night with a Vigil with a rosary in many different languages, a candlelight procession and finally a Mass at 10:30 at night, at which I presided. 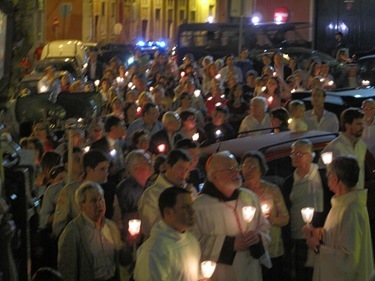 As you look over the plaza you see hundreds of thousands of candles burning in the darkness and listen to the enthusiastic singing of the Marian hymns which, in Portuguese, are many and very beautiful, it’s a most moving experience. 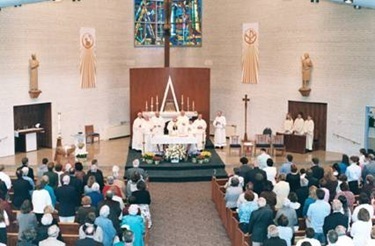 The next morning I also celebrated the closing Mass at 10 in the morning. I offered the Mass in a very special way for all of our priests, deacons, seminarians, religious, and lay people of the Archdiocese and asked the Blessed Mother to help us in our efforts in the New Evangelization and inviting people back to the practice of the faith. 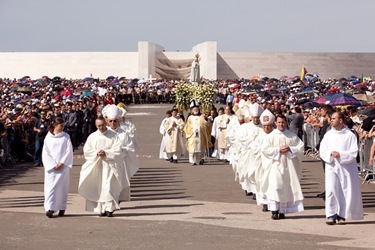 In a special way, this year’s pilgrimage was dedicated to the new Blessed John Paul II, who had a very special devotion to Our Lady of Fatima. This year, in fact, was the 30th anniversary on the attempt on his life. 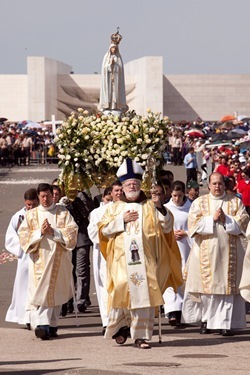 The Holy Father attributed his survival to the intervention of Our Lady of Fatima. 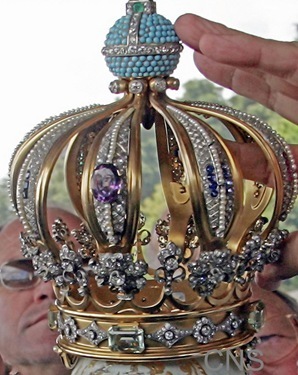 The following year he came to Fatima himself, and the bullet that was taken out of his body was then placed in the crown of Our Lady of Fatima. 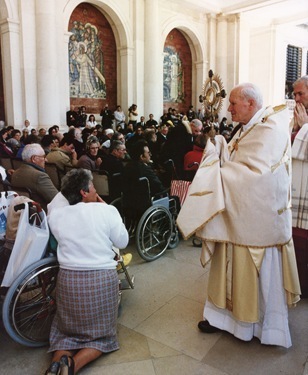 Three popes have gone to Fatima over the years, which shows the importance that the Church has given to these apparitions. Friday, at the end of Mass, they had a very beautiful video that was shown about the new Blessed. 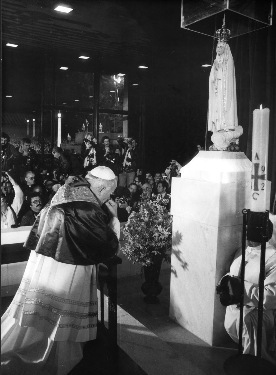 The ceremony concluded with a very moving hymn of farewell to the Virgin in which the people take out their handkerchiefs and wave goodbye to the statue as it returns to the chapel of the apparitions. 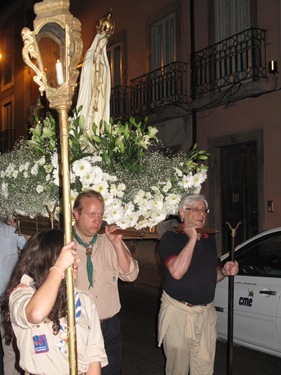 That evening, I travelled to Lisbon where I was invited to the parish of very close friends of mine, João and Maria Cortez de Lobão, where we had a rosary and candlelight procession through the streets of Lisbon that night. 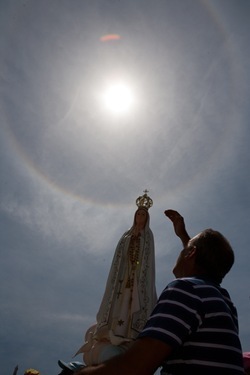 It was a quick trip, but it was a beautiful and moving celebration of Our Lady of Fatima. 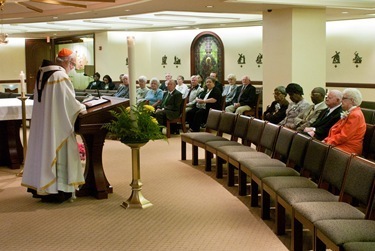 Back in Boston, I celebrated the 50th anniversary Mass at St. Athanasius in Reading on Sunday morning. 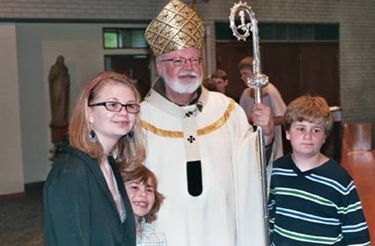 A number of the priests with connections to the parish were able to be present together with the current pastor, Father Darin Colarusso, particularly former pastor Father Bill Kremmell. They had a wonderful music program and an enthusiastic response, and of course there was a birthday cake for the parish in the parish center. 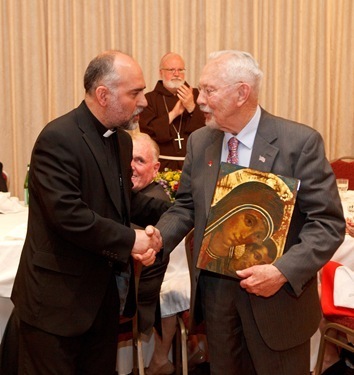 That evening I had the privilege to welcome the papal nuncio to the United States, Archbishop Pietro Sambi, at the 2nd annual Gala dinner for our Redemptoris Mater Seminary. The event was very well attended and there was great enthusiasm. 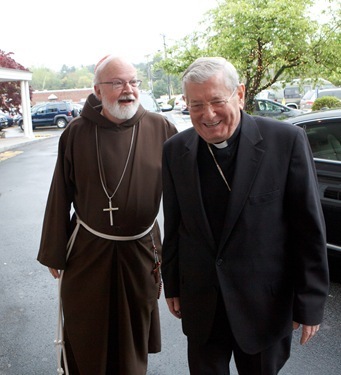 We also recognized Jack Shaughnessy who for many decades has been a great supporter of all of the Archdiocese’s priestly formation programs. Jack has a beautiful family, and many of his children and grandchildren were able to accompany him for the evening. 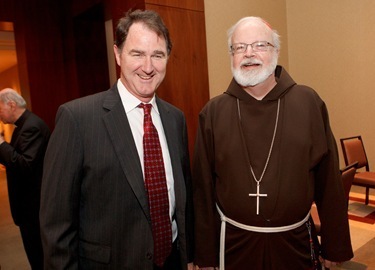 I was also very pleased to see Ambassador Ray Flynn and his wife Kathy were able to be there to support the seminary. We had a presentation on Blessed John Paul II, particularly focused in his apostolic zeal and on his call to begin a New Evangelization of the Church. As I said to the guests in my remarks, the Redemptoris Mater Seminaries are a reality today because of his pastoral creativity and inspiration. 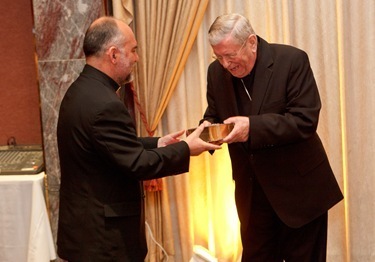 A beautiful present was given to the Nuncio, a lovely Italian Jerusalem Bible which I’m sure he will treasure. 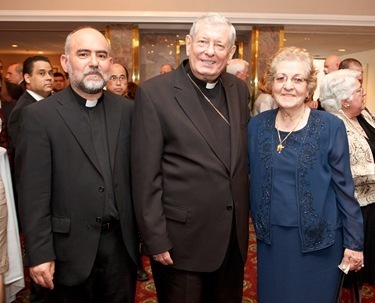 The Nuncio was in the Holy Land twice during his career, first in the 1970s and then between 1999 and 2005 as the Apostolic Nuncio there. 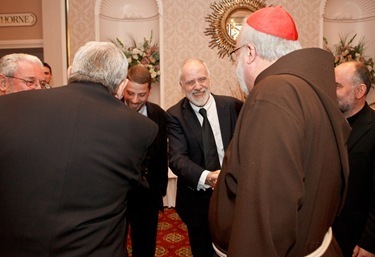 Because of his time in the Holy Land, he has a very long and beautiful friendship with the Neocatechumenal Way, which is very active there. He is very cognizant of the work being done at the Domus Galilaeae Center promoting interfaith dialog, particularly with the Jewish people. 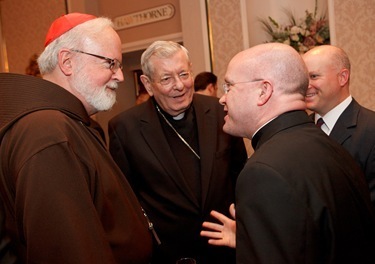 He is an enthusiastic supporter of the Redemptoris Mater Seminaries and we are very happy that he accepted the invitation to come to Boston to be a part of this event. Monday evening I was happy to participate in the ceremony to present the Cardinal Humberto Medeiros Scholarships at Boston University. 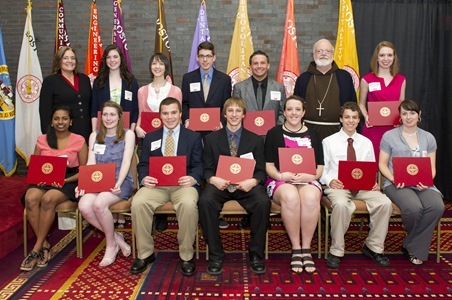 BU awards full scholarships to 12 graduates of Catholic high schools in the Archdiocese. 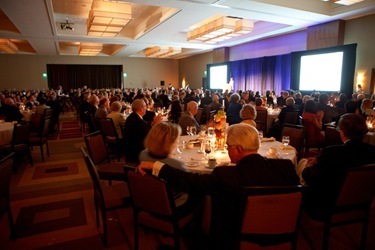 Since the scholarships were instituted by the then-president of BU, Dr. John Silber, in 1986 over 300 hundred students have been given these scholarships which are worth to date $35 million dollars. 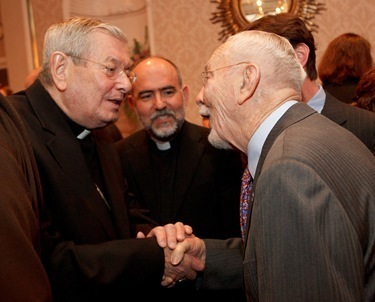 Dr. Silber knew of then-Bishop Medeiros’ work with immigrants as bishop of Brownsville, Texas, and then came to know him well when he became the Archbishop of Boston. Dr. Robert Brown, the current BU president, was unable to be there, but he was represented by Vice President for Enrollment and Student Affairs, Dr. Laurie Pohl. This year’s recipients of the scholarship were: Sean Ahern from Arlington Catholic High School, Brendan Bowdridge from Pope John XXIII Central High School, Danielle Conneely from Archbishop Williams High, School, Jaclyn Fulton from Austin Preparatory School, Kelly Gauthier from Bishop Fenwick High School, Sean Gunning from Xaverian Brothers High School, Dennis Marquis from Archbishop Williams High School, Nicolle Ouellette from Presentation of Mary Academy, Claire Pozniak from Notre Dame Academy Hingham, Kasthuri Sivalogan from Newton Country Day School of the Sacred Heart, Lindsay Smith from Mount Saint Joseph Academy and Matthew Talbot from Xaverian Brothers High School. 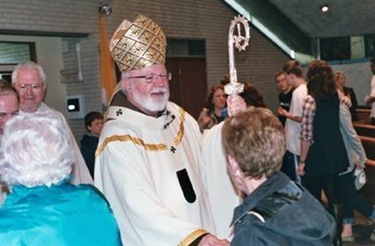 It’s a wonderful opportunity for graduates of our Catholic high schools. 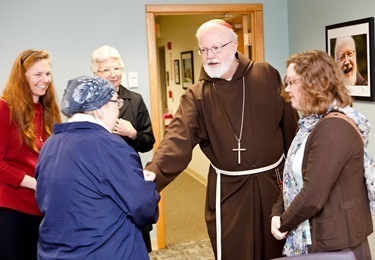 Another nice feature about attending college at BU is that we have a very robust campus ministry program there, with a large participation from the students. 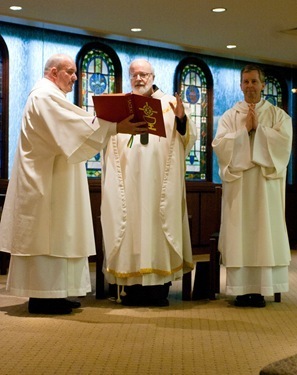 The university has always been very supportive of the Archdiocese and our ministry there. 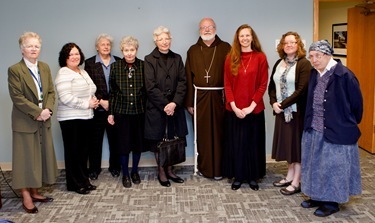 For many years we had Sister Olga and the Brotherhood of Hope lead the campus ministry at BU and they are now leaving to begin some wonderful new initiatives. 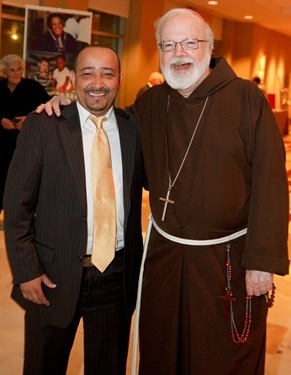 We look forward to Fr. John McLaughlin and the FOCUS group going there to continue the extraordinary work of the Brothers and Sister Olga have done. 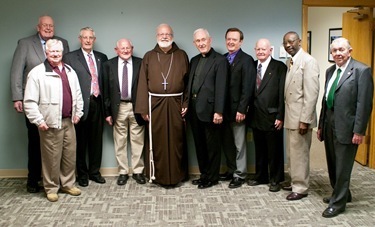 On Tuesday we celebrated Mass at our Pastoral Center for the deacon jubilarians, the class of 1986. 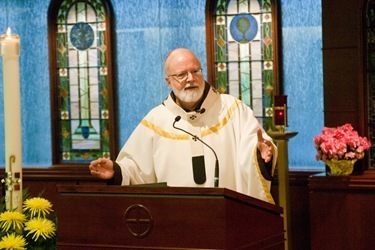 Father Tom Foley, who was then the director of the program, joined us for the Mass. 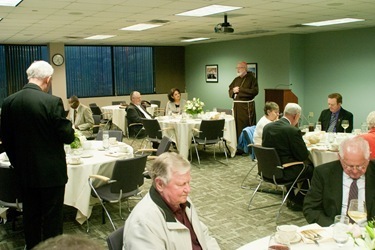 Afterward we had a dinner where I was able to spend some time with the deacons and their wives. Wednesday I celebrated Mass for the Consecrated Virgins in the archdiocese. Once a year we meet with them so we can hear an update on their activities. 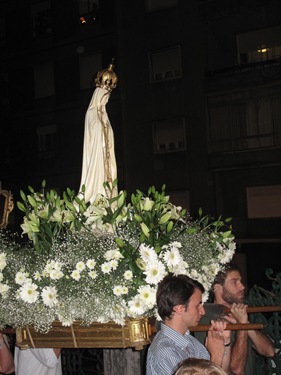 The charism of the Consecrated Virgins was very prominent in the first centuries of Christianity and now has been newly restored in the Church after the Second Vatican Council. We are very blessed to have a number of women who have answered this vocation in our Archdiocese. 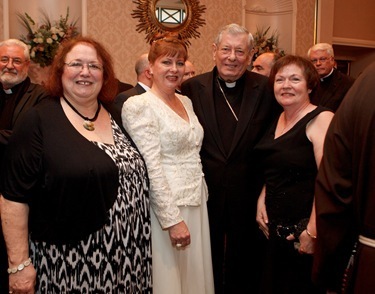 Each year Catholic Charities has a gala dinner that I am happy to be able to attend. 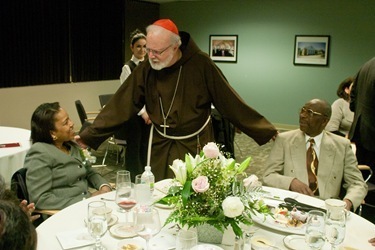 With the new demands on the services of Catholic Charities due to the economic crisis and the cutbacks in government funding, these sorts of fundraising efforts are more important than ever. 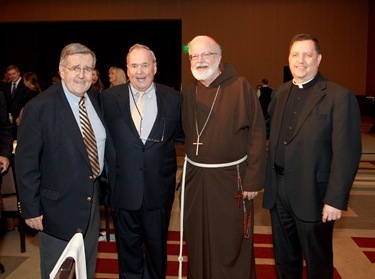 I am pleased to say that they announced that the dinner raised $1.6 million to support Catholic Charities’ critical work. 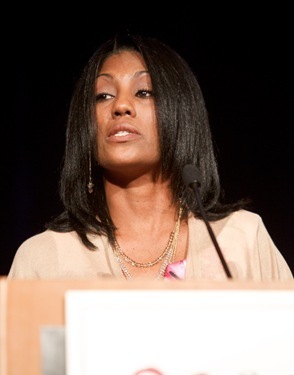 One of the people who addressed the banquet was Leosandra Santiago, a young woman from Santo Domingo who had been living in a shelter. Through the help of Catholic Charities she learned English and now is employed and is able to provide for her children. 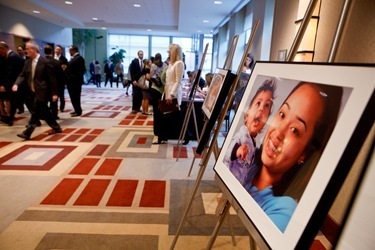 It’s just a beautiful story of how Catholic Charities is able to change people’s lives. 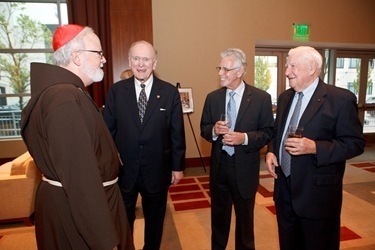 This year the alumni of Notre Dame University were an important part of the fundraising as we honored past president Father Theodore Hesburgh. 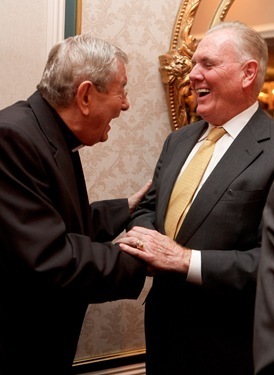 Father Hesburgh will be 93 next week and he is known and beloved by many generations of Notre Dame alumni, many of which were present at the dinner that was co-chaired by John Mahoney and Brian Moynihan. 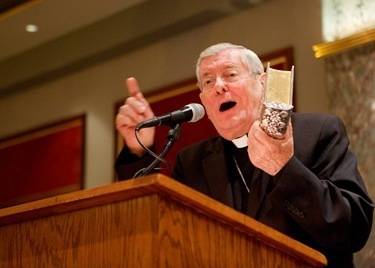 Father Hesburgh was unable to be present, because he recently underwent surgery, so the award was accepted on his behalf by Notre Dame’s current president Father John Jenkins. 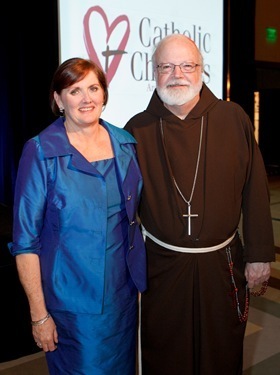 Debbie Rambo, who became the president this year after many years of service at Catholic Charities, is doing an outstanding job. 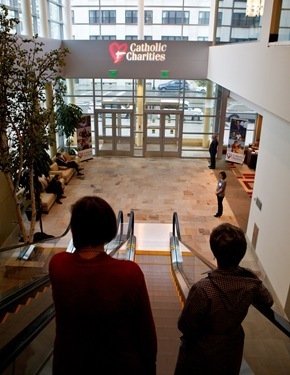 This past year, Catholic Charities served over 200,000 people at thirty different sites. I want to conclude this week reminding you that tomorrow morning at 9 a.m. 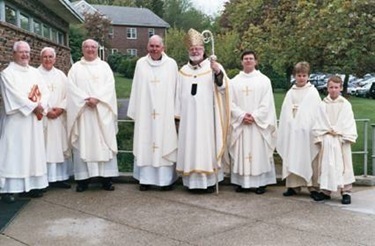 I will be ordaining six fine men to the priesthood at our cathedral: John D’Arpino, Michael Farrell, Seán Hurley, Kwang Lee, Mark Murphy and Carlos Suarez. Please remember them in your prayers as they begin this service to the people of God!